Like many of Rajasthan’s royal cities, Udaipur is also a well known tourist destinations in the world. Its magnificent architecture, kaleidoscopic culture, historical heritages, picturesque locations and regal palaces, all have charmed the whole world, since time immemorial. Often called as the ‘City of Lake’ and ‘Venice of East’, the city exudes an imperial charm. One of the greatest examples of the cultural and historical heritages of the city is ‘The Lake Palace’, placed proudly at the heart of the scenic Pichola Lake. The traditions, arts and crafts of the city are preserved from centuries. The architectures are a blend of Rajasthani and Mughal style. We at Tixilo.com aim to ensure that your visit to this majestic city is enjoyable and comfortable. We offer bespoke car rental Udaipur services, for a relaxing, pleasant and effortless. We provide the world class car rental services to meet each and every need of yours. Whether you want transfer from hotel, airport, bus stand or railway station, travel locally to the famous tourist attractions, or out of city trips, we have customized services to suit your need. We not only assure you high quality ride, we also provide you the safest commute. Our well trained and highly educated drivers are well aware of their duty to make sure that your ride is one of your finest experiences in the city. If you are planning your next holiday in Udaipur, then the Tixilo car rentals promise to make your journey in the City of Lakes much more comfortable and as convenient as possible. We are a renowned online cab booking service in India. Our economical and efficient car hire in Udaipur makes sure of providing you an unforgettable travelling experience in the city. Why choose Tixilo cab rentals in Udaipur? Just like other Rajasthan’s royal cities, Udaipur is also a well-known tourist destination in the world. Its magnificent lakes, historical heritages, picturesque locations and regal palaces allures tourist from all around the world. And to add to the comfort of tourism, you can easily book a Tixilo cab online through their Tixilo mobile app or website Tixilo.com. Besides tourism, if you are visiting the city for business or for any other reason, you again can hire a Tixilo cab for your travelling needs. For local visitors also, we offer bespoke car rental services in Udaipur, for a relaxing, pleasant and effortless travelling. We provide world class car rental services to meet all your requirements. Not only we assure you high quality ride, we also provide you the safest commute. You can book from our choicest rides for a half day journey of 4hrs/40 kms or for a full day ride of 8hrs//80 kms. 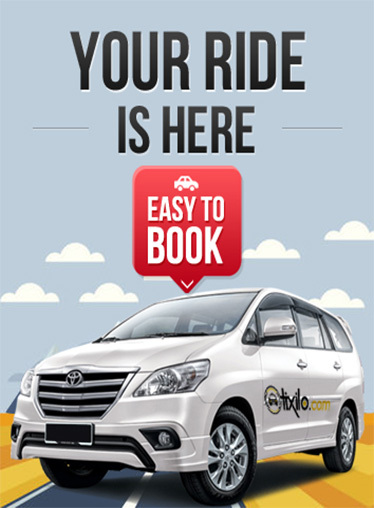 Tixilo cab rentals is a reputed and reliable company that offers taxi rental services in most of the cities of India. Complete customer satisfaction is our prime ambition and therefore we believe in providing the highest quality services to our clients. Let us take a look at the main benefits of choosing Tixilo cab rental services in Udaipur. Bespoke cab rental services, including local, outstation and one way. Easy online and mobile app cab booking.